On the edge of the Norfolk battle training area, stuck away in the woods, is the tiny Catholic church of Our Lady of Consolation and St Stephen. It was built by the fabulously wealthy Mrs Lyne-Stephens in 1878. She lived at Lynford Hall, and, as Pevsner puts it, 'tired of travelling into Thetford' for Mass. She is most famous for bank-rolling the vast Our Lady and the English Martyrs in central Cambridge, which many tourists mistake for a cathedral, but Our Lady and St Stephen was her private chapel. Although the architect was Henry Clutton, it was built at the time Pugin was working on the nearby West Tofts parish church; the altar and reredos here are by Pugin, and Pevsner thinks he influenced the rest of the building as well. Mrs Lyne-Stephens inherited over a million pounds from her husband's estate - this is equivalent to about two hundred million in today's money. But when she died, the estate was bought by an Anglican, who considered the church 'a terrible eyesore', and planted the screens of trees around it to hide it. These, now mature, make the building very difficult to photograph. 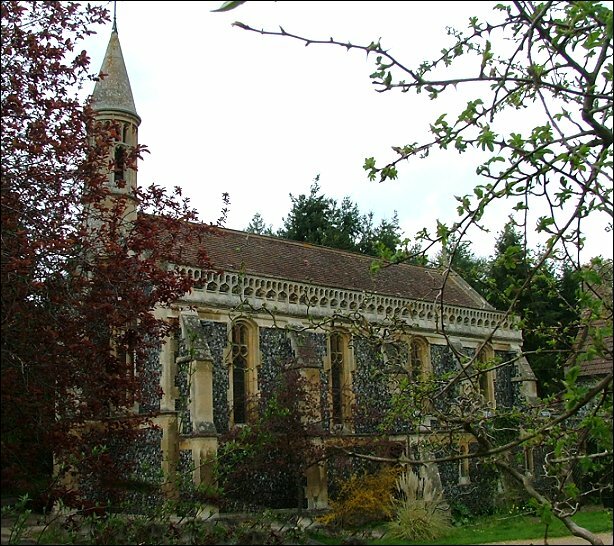 The adjacent presbytery is now a private house, and the Church is served from Thetford. Liturgically, all Catholic churches should be open, or at least accessible. In practice in East Anglia, most are not, especially outside the towns. Technically, this is a chapel of ease, not a church, and so the same doesn't apply, but it won't surprise you to learn that we found it locked when we called in July 2004. 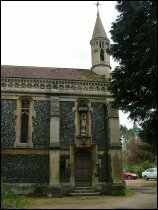 At that time, the church still hosted the Thetford parish anticipatory Mass every Saturday night, but the Diocese mothballed it shortly afterwards, so that people had to travel into Thetford for Mass (the thinking being that Parish communities should not be separated by Mass stations if possible). The church was declared redundant, but was taken over by the wonderful Norfolk Churches Trust. 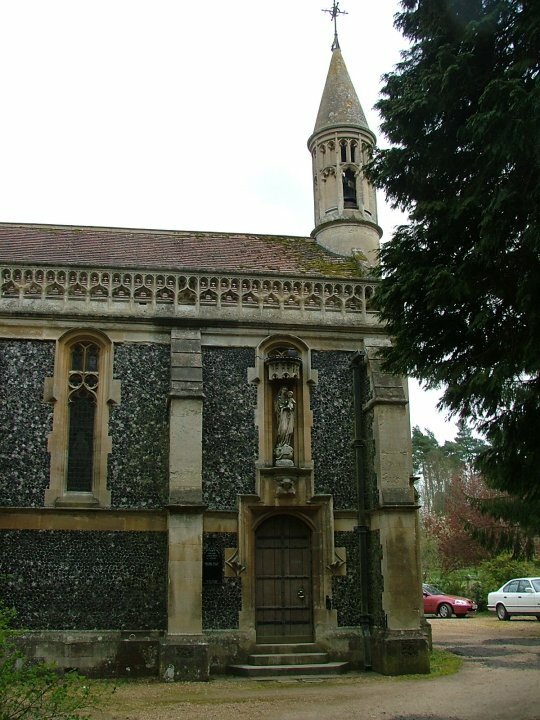 It is under the pastoral care of Thetford parish, and still hosts occasional Masses.